In sports, not everyone can be winners. Some must come in second, or third place. Some must come in dead last. Some don't even do that. Just ask Hiroshi Matsuyama. 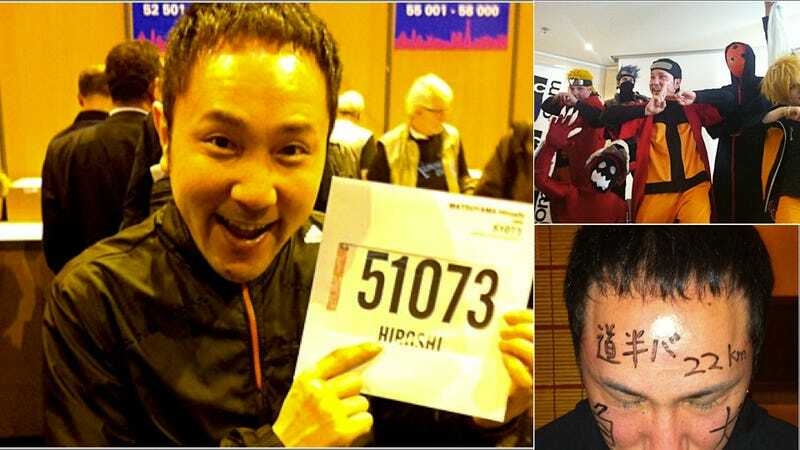 He's the head of Japanese game developer, CyberConnect2, and to mark Naruto selling ten million video game spin-offs, Matsuyama decided to run the Paris Marathon dressed as the iconic ninja. There is a reason why runners train hard for marathons. That's the same reason why Matsuyama didn't finish the marathon, making it only 22km. "Only"! Ha! Matsuyama revealed that he failed to finish the race, and uploaded photos of the game exec honcho with with "loser" written on his cheeks in Japanese. Loser or not, it seems like he has a good attitude about the whole thing.